The current project, an expansion of the Hamma Hamma River Steelhead Supplementation Project, includes three additional supplemented streams (Duckabush River, Dewatto River, Skokomish River) and three control streams (Little Quilcene River, Tahuya River, Big Beef Creek). The project collects fertilized eggs from naturally constructed redds in the Duckabush, Dewatto, and Skokomish Rivers. These fish are then reared in hatcheries until they are released back into their natal rivers. Before, during, and after supplementation, the project monitors adult and juvenile abundance, genetic composition, and life-history patterns in all study streams. The project is a large collaborative effort to conduct work on seven Hood Canal streams. The Salmon Center’s focus is to carry out field work on the Dewatto and Tahuya Rivers and smolt trapping on the Little Quilcene River. 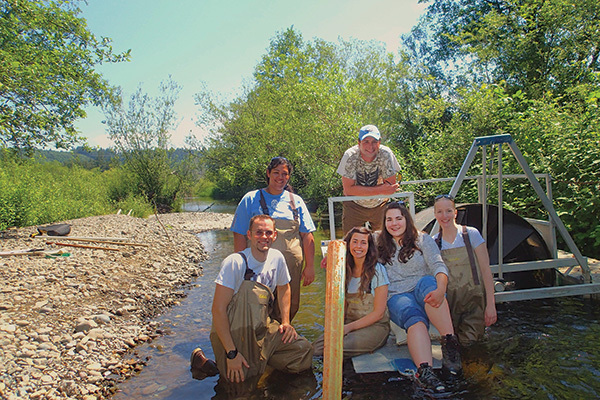 Hood Canal Salmon Enhancement Group (HCSEG/The Salmon Center) strives to deepen the connection between land, people, and salmon through restoration, education, and research. Our mission is to ensure that wild salmon are once again abundant in the Pacific Northwest.